Here’s a question just for fun. In the past 30-40 years, which advance in tooling has made the biggest practical change in small shop furniture making? An individual tool, a type of tool, or a major upgrade in a tool category, hand or power, all qualify. The answer will depend on the definition of “small shop.” What I have in mind is what I most relate to, which is the one-person shop making high-end furniture and accessories. Such a shop produces one-of-a-kind pieces or very few repeats, and may be an amateur at home, or a professional, whose furniture making is only part of his income. OK, with that in mind, drum roll . . . my vote is for the Ryobi AP-10 portable thickness planer, which was first made in about 1985 or 1986, as best I recall. This humble machine, which I owned back then, was the first lightweight, portable, low-cost way to easily and quickly thickness large quantities of wood. The Ryobi begot improved competing models, such as the much later DeWalt DW735. For the small production shop, I am guessing CNC, along with CAD, has made the biggest difference. For shops of any size, the overall improvement and proliferation of carbide-tipped tooling – router and shaper bits, table saw blades, bandsaw blades, jointer/planer cutters, etc. – may be the biggest advance. To impart the touch of quality that is only possible with hand tools, we must, of course, acknowledge the roles of first, Lie-Nielsen, and then, Lee Valley/Veritas. More than with vintage tools, new Mercedes-quality handplanes became readily available and indeed, the standard, which elevated everyone’s work. As a tool category, this may be the most significant advance. The same evolution occurred in Western hand saws, culminating, in my opinion, in the Bad Axe line. Other tool categories that came to mind in thinking about this include: greatly improved tool batteries for cordless tools, the wider availability of high quality steel-frame bandsaws sized for the small shop, the wider availability of wide over-under jointer-planers, and the availability of excellent Japanese hand tools. For individual tools, the biscuit joiner, Saw Stop table saws, and Japanese waterstones deserve some notice but I would not consider these pivotal. Oh, and there is one more “tool” that, come to think of it, probably has made the biggest difference of all: information! Books, magazine, video/Internet, classes, and so forth have tremendously advanced the joy of good woodworking. It’s all good. We are fortunate. The internet has been helpful for ideas and info. Other than that, I don’t really think any newer tools have made much difference. I cannot think of any new tool whose function could not be performed just as quickly and efficiently with an old (pre-1950, or even pre-1800) tool. What is lacking is knowledge, not tooling. I do not agree with “new Mercedes-quality hand planes became readily available and indeed, the standard, which elevated everyone’s work.” If you can tune a plane, the old ones worked just as well as the new highly priced ones. That said, I cannot argue that Lie-Nielson has made it much easier to reliably acquire amazing tools, but at a steep price. Oh, and I love your shop! Rob, all great thoughts! I enjoy reading your blog, though I don’t interact much, so just wanted to say thanks for sharing. Also, your shop looks like a lovely place to work and spend time in (so much so that I’ve saved the image for future inspiration)! Very clean, organized and practical. Yeah, the handplane difference is mostly a matter of ease and availability, even if just perceived. I do think the accessibility has been a key for most woodworkers. I must agreeably disagree, however, regarding the portable thickness planer, since I’m sure stock can be thicknessed faster and more efficiently with it than by hand. Yeah, Bill and Jared, I love my shop too! 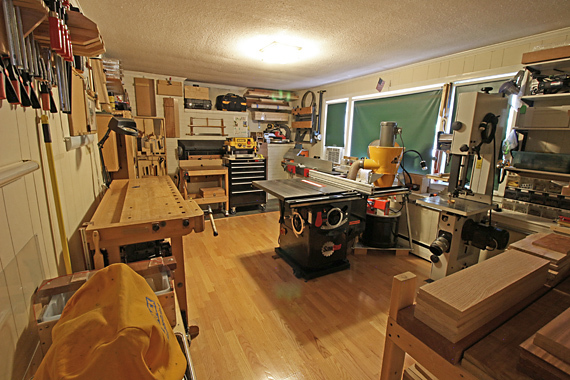 Jared, the floor layout and some of the systems are detailed in an article in Fine Woodworking issue #237, Winter 2014, Tools and Shops, and it is reprinted in their “Workshop Solutions” compendium, Winter 2017, And you’re welcome to stop by if you’re in the area. Rob – I see you have your 735 thickness planer on a toolchest rolling cart. Do you roll the cart out and lock the wheels when you use the thickness planer? That tool chest almost never moves. I set up the Workmate (you can see it stored folded on the wall near the right back corner of the shop) and lift the DW735 from the tool chest onto the Workmate. I clamp the DW735 on the Workmate so there is no danger of it moving in use. It’s all easier than it might sound. Hi Rob- Do you typically use the DW735 for planing, and your Hammer A3-31 for jointing. Am starting to look at combo jointer / planer units, but would be interested in knowing if you typically use separate machines for these 2 functions. You mentioned in a previous article you have a Byrd cutter head on the Dewalt vs the straight knives on the A3-31. One other question- have you experienced a compelling reason to go with anything wider than the 10″ capacity of the A3-31? Great question, George. Thanks for asking. I’d like to answer in detail as a separate post to update the large amount of information I’ve written on both machines. Coming soon. « Do woodworkers still need books?